I continue to be thankful about all the wonderful things that have happened for Moonlighting Quilts this year. Currently, we’re getting a lot of great press. It’s all very exciting! Too Much Soul to Control is featured in a short article in the James Renwick Alliance Quarterly. Click here to view the JRAQuarterly PDF. The client who commissioned the quilt wrote the article and worked to have it published so that she could share her quilt with the world. 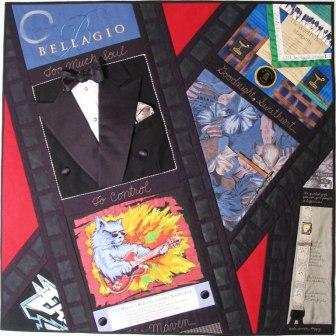 Too Much Soul is a tribute quilt honoring her late husband. Click here to read more about the quilt on my website. The Renwick is part of the Smithsonian Institution; the James Renwick Alliance is an organization that supports the Renwick. If you live in the D.C. Metro area and you haven’t visited the Renwick, it’s worth the trip. The gallery spaces are intimate and the gift shop is filled with treasures. Coming in January, Washingtonian Magazine will carry an article on Mentor, Guru & Sage, another tribute quilt I created for a client. Again, the client commissioned the piece to honor her late husband, who was very active in the art world. 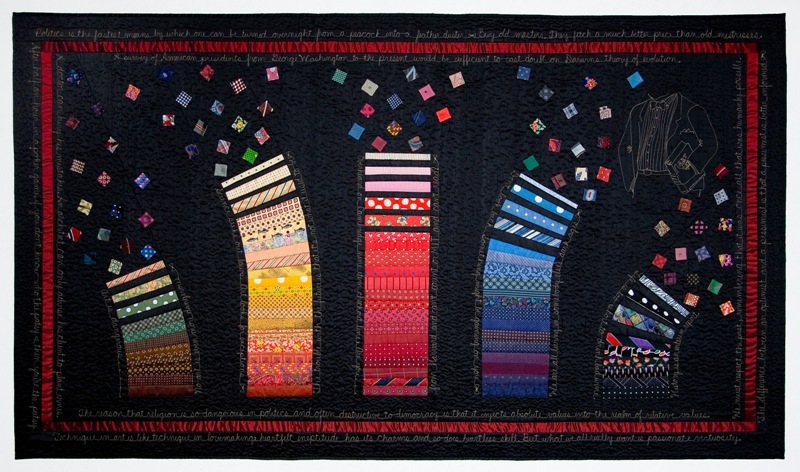 Click here to read more about the quilt in my website. These two articles were exciting surprises for me. Both were driven by clients with little or no input from me. I am truly grateful for amazing clients. Writing for a magazine was a new experience for me — one which included an important lesson. While the vast majority of the writing in that article is mine, there were some additions made after I sent in my draft. In case you are offended by any of the references, please know that the editors do in fact edit and, in this case, added a few things that I would not have written. That said, I am very, very excited that my article, “61 Ways to Rev Up Your Quilting,” has made it out into the world. Thanks, Mark! Last, I have one more article waiting to be published. The premier issue of Machine Quilting Unlimited is due out this month and will include my article on QuiltWriting. While I love all the steps of creating a quilt, I believe the real magic happens when you add the quilting. This new magazine concentrates on what to do with the quilt after the top is complete. Finally, a magazine that addresses that final step: quilt as desired! I can’t wait to read it! Ask for Machine Quilting Unlimited at your local quilt shop or sewing machine shop. Or, click here to subscribe online. While I love to write, I’m going to have to ignore the siren song of my computer for a few weeks while I try to finish some quilts. As my friend Kathy Lincoln declared in January, “This is the year of getting things finished.” So, back to work!